Are you making common document management mistakes in your business? At Access Information Management, we are proud to be the go-to document management company in the Greater Chicago area, and as such, we’ve helped many businesses find a better solution for their records management needs. Many of these companies were managing their data on their own — and making common mistakes that cost them in money, time, customers and more — most without even realizing it. Are you making any of these common document management mistakes in your business? Mistake #1. You keep your files in-house. All businesses have to start somewhere, and when you’re just getting started, in-house is probably your only option for storing your files. However, that doesn’t mean that it is always going to be the best option. As you grow, your files grow too, and eventually, they will start taking up much-needed space in your building. Additionally, in-house document storage also becomes difficult to manage once your business reaches a certain size. Plus, in-house is the least secure place for any business to secure inactive physical files, as well as electronic data. Mistake #2. You haven’t properly indexed or organized your files. The point of document management is to be able to quickly find the files you need when you need them, not just to keep them out of the way. Too often, businesses don’t properly organize and index their data. Then, when they need to find specific documents, they end up wasting their time and resources searching high and low for what they need. Don’t just keep your documents out of the way. At Access Information Management, we utilize a state-of-the-art barcoding system that allows us to retrieve any data you need at any time. Mistake #3. You haven’t converted your physical documents into digital. This is an incredibly basic mistake, but it could end up being a huge mistake, especially if something were to happen to the physical documents you need. There are just too many risks to your physical documents, and there are only a couple of things you can do to truly protect them: move them off-site to a secure facility or convert them into digital documents. Here at Access Information Management, we think that doing both is the only sure-fire way to truly protect your physical records. Mistake #4. You’ve put off outsourcing document management. For the most part, no company should handle document management themselves. Not only are there federal laws and regulations in place that you need to comply with, but you have an ethical responsibility to your customers, patients or clients to protect the information they are trusting you with. Outsourcing your document management and moving your files to a safe, secure facility is the only way to keep that information completely safe and secure. At Access Information Management, our facility is designed for the ultimate in security. We have constant surveillance, an advanced fire suppression system and a multi-level security system to keep your information safe at all times. Mistake #5. You toss instead of shred old documents. 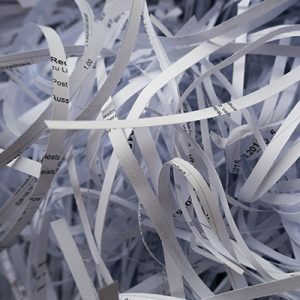 If you throw your old documents away instead of properly destroying them by shredding them, you are doing a disservice to your patients, clients and customers. Your trash is a potential goldmine for criminals looking for private information they can profit from. But criminals aren’t the only ones you have to worry about when it comes to throwing sensitive information in the trash. Private investigators, your competitors and even the media could dig up dirt on you (or your clients) by digging through your trash. Shredding old documents allows you to completely eliminate sensitive information, keeping it out of the wrong hands and protecting your customers and your business. Every company, no matter what industry it is in or how big or small it is, needs a good document management system in place. 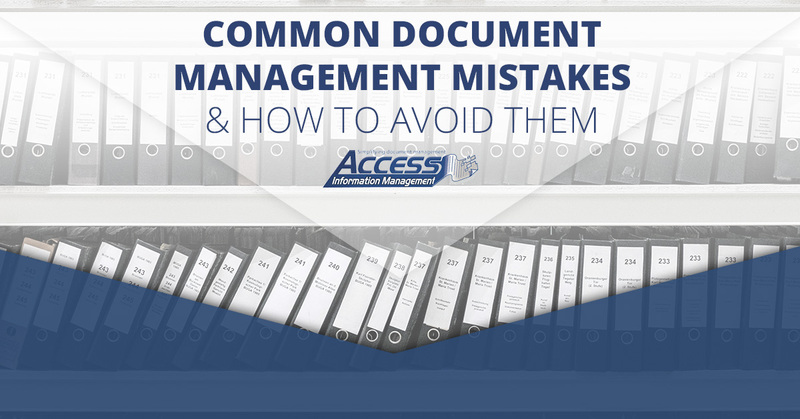 If you continue to make these common document management mistakes, it puts your customers’, clients’ or patients’ data at risk, leaves you open to legal fees and other penalties, hinders your company’s efficiency and could even hurt your reputation. But the good news is that these mistakes are easy to avoid when you hire the right document management company. At Access Information Management, we have what it takes to handle all of your document management, and we serve all of Chicago and the surrounding areas. Get your free estimate today!